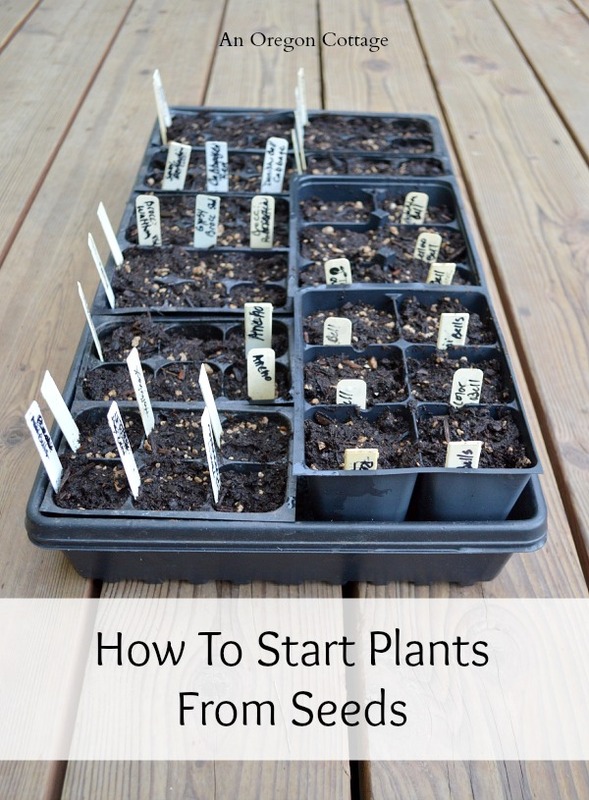 An easy tutorial for how to start plants from seeds to save money and have the varieties you want, when you want to plant them in your garden. 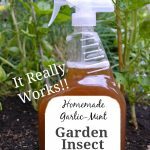 It’s the best thing you can do for your garden! Let’s start some seeds! 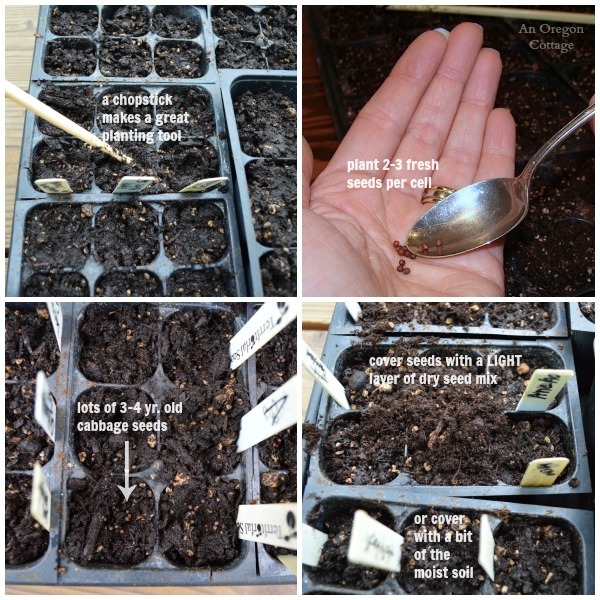 In this second installment of our Vegetable Garden 101 series I’m going to share how to start plants from seeds indoors weeks or months before your planting season. This way you can use your own seedlings when it’s time to plant in your area, saving and by-passing the stores. It’s so rewarding to see those first sprouts, knowing they will become the food your family will be eating in just a few months. That’s when you know you’ve gotten the gardening bug! To save money. 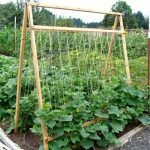 Starting vegetables from seed can be less expensive, although it can be expensive if you buy a lot of specialized equipment the gardening stores and catalogs want to sell you, so you’ll want to be careful and not go crazy when you see all the great things you can buy. Most seeds are viable for 3-5 years, so that $2 packet of seeds can provide plants for a number of seasons. For control and selection. This is the main reason I start some of my plants from seeds: you can choose new varieties you want to try, or that are specialized for your region, or vegetables you’ve read about, without being at the whim of a nursery buyer. To have the best growing dates for your garden. You can time your seedlings for your specific frost dates, stagger dates, as well as plan some seedlings for July or August for fall planting when it’s nearly impossible to find starts in the stores. 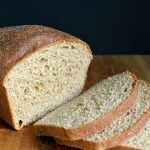 It’s not hard, but it always helps to have pictures I think, so here’s a step-by-step of my technique (hint: it’s not fancy) that I’ve used for years. 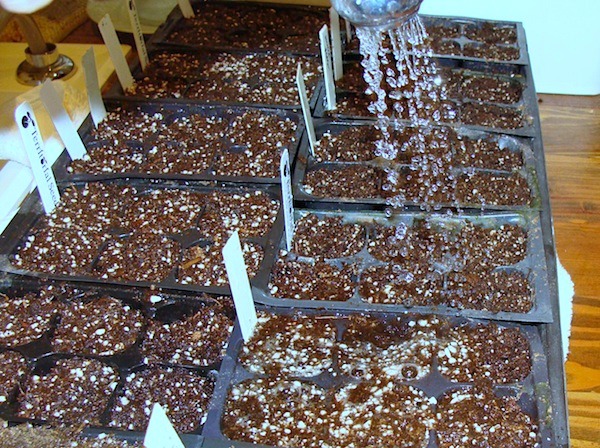 I find planting in cells much easier than just laying the seeds in flat trays filled with just soil – there’s less thinning needed and less root disturbance when planting. Affiliate links are included for your information. Seeds. Buying from online catalogs will give you the best selection and quality, but there’s nothing wrong with buying from the store, as long as it’s from a quality seed brand. Another benefit of catalogs: there’s a TON of growing information in them, so you can learn a lot, too. Go here to see a list of catalogs I like to buy from. Grow light or a basic shop light with 2 flourescent lights, one warm & one cool. I’ve always used the basic shop light set up at about half the price of ‘official’ grow lights and it’s worked great. Make sure they have chains or ropes so you can raise and lower to lights to be right over the seedlings as they grow. 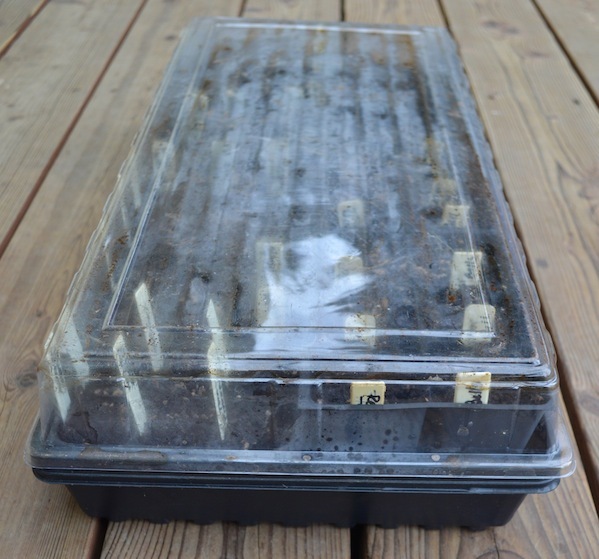 Plastic planting tray unit with a clear dome and twelve 6-cell pots which last a number of years. Note: I don’t like the “Jiffy Pots” type of trays you may see – they dried out faster and stunted the growth of some of my plants when I planted them directly into the garden as instructed – the roots weren’t able to grow through the membrane and became root-bound. You can buy the trays without the 6-cell pots, too, and fill them with reused 4-inch nursery pots (18 fit perfectly) to fill them (pictured in the back left tray above). I like to use this set up to plant peppers and tomatoes in the bigger pots – it means one less transplant I have to do, because these plants should be pretty big before planting them in the garden. Wash them out yearly with a good spray of water (I never use bleach because I don’t like using it and have never had a problem with fungus issues since I use sterilized potting soil). Sterilized seed starting potting mix. 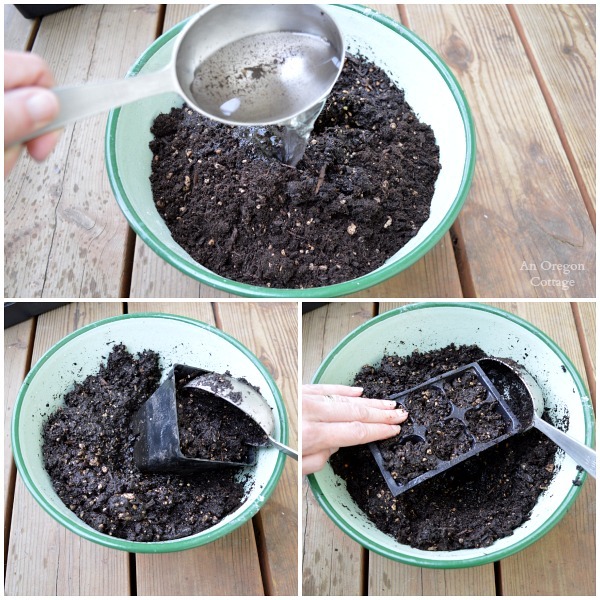 I’ve never skimped with the soil by trying to reuse old soil. This is the basis of great seedlings, so it’s worth the (slight) extra cost. Some potting mixes (like the one I linked to) even includes extra nutrients or fertilizers (though I always go organic) to give your seeds a boost. 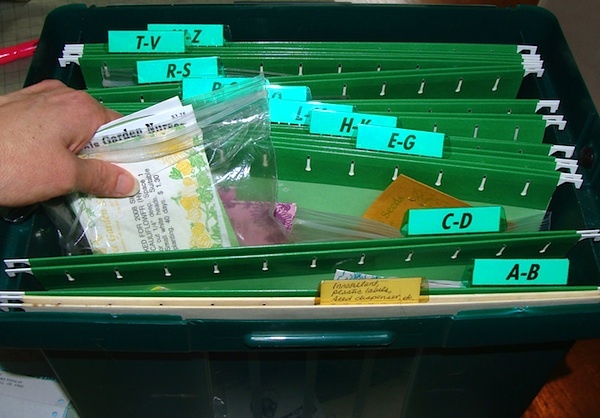 Plastic garden labels – this link is to my favorite labels- not too big so they fit in the trays, easy to read, and last a number of years. Sharpie or garden marker pen. Every time I think I will save time by not labeling every single plant cell, I am sorry. You will want to know what you loved so that you will be sure to grow it again AND you will want to know what not to plant again! Old mixing bowl or container for wetting soil. Large spoon or soil scoop for mixing and filling cells. Chopstick or small tool for making shallow indentations. 1. Gather your seeds to plant. Read the backs of the seed packets to find when to start indoors according to your last frost date and when you want to plant out in your garden (it may be different if you are using covers in the garden and you can plant earlier – again, another great reason to start your own seeds). Plan how many of each seed variety you want (tip: start small – you probably don’t want 12 heads of broccoli all at once…) and have room for. Note: pictured is my simple and basic seed-saving system: a portable file box (which should be opaque so light doesn’t get through) with a lid and hanging files with alphabet labels. I put individual seed packets in baggies according to type (i.e., all broccoli varieties together in one baggie). The baggies make it easy to find the packets when I want to plant carrots or whatever, and they are supposed to help keep the packets better for storage. Then the baggies are filed alphabetically. It works great – I have used 5 year old seed from this system and had them sprout fairly well. 2. Wet the seed mix. If you put it directly in the cells and then try to wet it, the centers will still be dry and you’ll have to stir each individual pot, which is not easy. I use an enamel pot, fill it with stating mix add water. It takes awhile to get it thoroughly mixed, depending on the amount of peat that’s in your mixture. 3. Push the wet mix into the potting tray cells, tamping down to firm. The soil will probably be somewhat clumpy, and may not go into the cells nicely for you, so don’t be afraind to get dirty! Fill the cells/pots full, because when you water them the dirt will sink a bit and you want as much soil as possible for your little seedlings. 4. Make labels and place in trays. 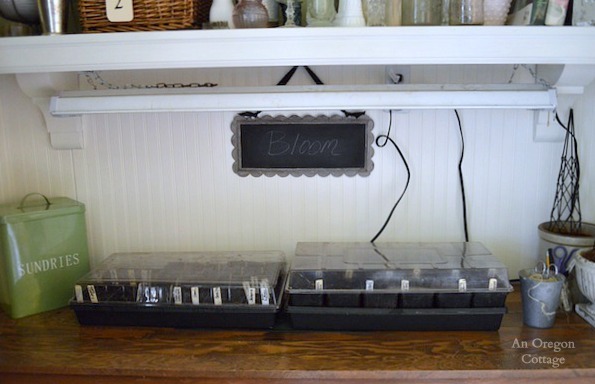 Use the sharpie/garden marker to write what seed variety will be in the cell on a plastic label and place them in the trays where you’ll want the seeds to go before planting. Doing this first helps map out your placement, determine the amount of room you have AND helps avoid the mystery plant syndrome. 5. Use a chopstick or other small tool to make a shallow indentation, then sprinkle in 2 or 3 seeds. You’ll eventually thin to 1, but this allows for different rates of germination. 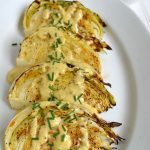 Flat, bigger seeds are easy to add to the indentations with your fingers, but for those tiny seeds like onion and broccoli, a chopstick or small spoon makes it easy to add only a couple. Tip: plant more than 2-3 seeds if using older seed packets because the germination rate goes down as it ages. Yes, it means there will be more thinning involved which seems wasteful, but believe me, it’s no fun to do all this and have only two seeds germinate in a 6-cell and then have to do it all again, only this time much later! 6. Gently cover the seed – most of the seeds we start inside are not big ones that need to be deep in the soil, so just barely cover the seed. You can use a bit more of the dry mix or push some of the moist soil back over the seed. 7. Plant all cells and water with a gentle WARM spray. The warmth will give the seeds a little head start. 8. Place a cover over the tray. You don’t technically have to have a cover, but it helps retain moisture until the seeds sprout. Set the tray under your grow lights, but don’t turn them on yet – the seeds don’t need light at this point (while there are a few seeds that need light to germinate, it’s mostly flowers that do – check the seed package). 9. Remove the dome/cover as soon as there are sprouts, even if not in every the cells. The extra moisture that was great for germination can cause fungus problems on the newly germinated seedlings. 10. 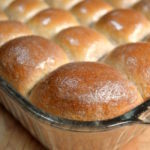 Keep moist and water from the bottom. 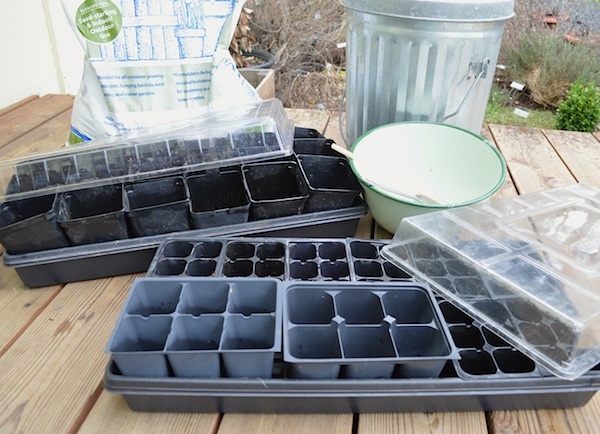 Always add water to the plastic tray (another reason I like using the cells) – lift a pot/cell and fill tray with water to keep the cells all evenly moist. And that’s all there is to starting plants from seeds! Where can I grow trays of seedlings, and how do they get light when they’ve germinated? The most basic source of light is windows, of course, but it’s usually not strong enough to produce strong, stocky seedlings. The seedlings will strain towards the light, growing tall and leggy, especially if you’re growing a large tray like I show. That’s why I suggest a light source that can be placed directly over the pots like the options listing in the supplies section. The light can be attached to a shelf or under a cabinet or you can build a simple stand to hold the light. You just need to have the ability to raise and lower the light source as the plants grow. As for where to grow them – where ever you can make a bit of space for a few months! 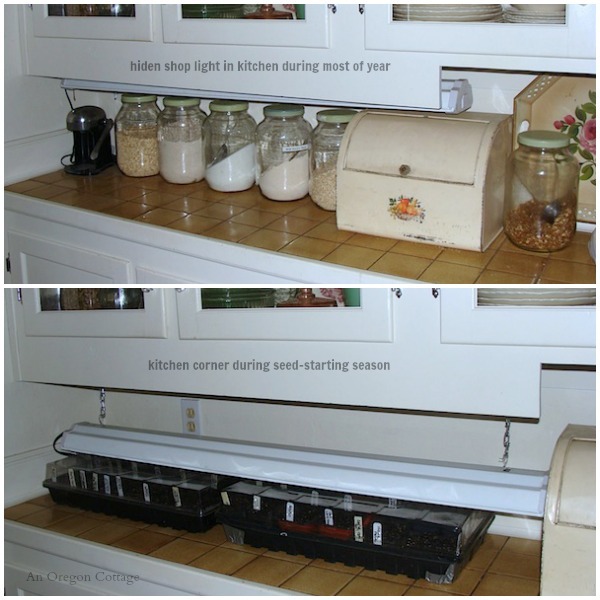 For many years, my answer to where to grow my seeds was a corner of my kitchen, shown above. The shop light was hidden most of the year and when I needed the light, I moved the storage jars, set my trays in place and lowered the light for the few months I’d need. In a previous house we built a simple structure out of 2x4s that we hung the lights from and kept in an office. Wherever you keep the light though, it should still be in the house, or at least someplace where it doesn’t get too cold (a porch?). Some people have had seedlings sprout faster using a heated grow mat, but at $50 bucks each, I haven’t tried one. Update: I was able to find a heated grow mat for half that price and and it really does help seeds that are harder to sprout like peppers emerge sooner – I love mine! Click Here to see the exact mat I use on Amazon. 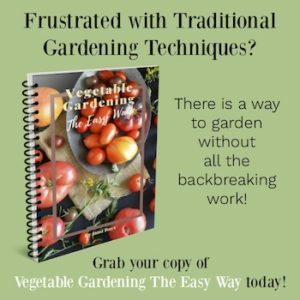 Note: Our classic vegetable gardening series was published in the first year of the blog – 2009. It’s been republished with updated information and clearer formatting. 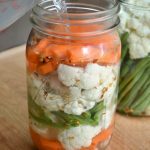 Thanks for the great seed starting tips. Very informative and easy to follow. I very much want to get better at gardening. I live in northern CA, in rather a hot summer valley. I have a greenhouse, which currently has my summer vegetables and herbs. I want to prepare for a fall garden this year. Do you think I should start my seeds inside, like you suggest? It remains hot here through September (like 100 degrees hot). Is it the heat or too much sunlight that hinders the fall plants? I’m thinking that transplanting stuff like brussels sprouts and broccoli in Aug would be too hot. Also, what does “overwintering” mean? Jami- I love your explanation of how to start seeds. Very informative. 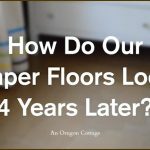 One question: do you use the mat and the light together ? Or one or the other ? And another thought… How do you subscribe to your blog? I’m so glad you want to subscribe, Robbie! Just type you email address into the “subscribe & connect” box in the right sidebar (above my welcome photo) and follow the directions. 🙂 And I do use both the heat mat to warm the roots and the light to help them grow straight and tall (I found that putting them next to a window does work, but that the seedlings grow leggy and towards the light). I’m glad you found the steps helpful! Do you thing we could use a heating pad in place of the heated growing pad? I know you would have to be careful not to get it wet, but maybe you could put something on top of the heating pad like an old computer mouse pad. Just a thought. Reading all your posts on starting seeds and taking notes! Like you I am cheap and Lazy. Love all the pictures and instructions. One question on the cheap shop light…..is there a certain kind of bulb or watt you use? Thanks for all you do! Your blog is my FAV! I’m honored to know you’re subscribing! I am reading everything you have on starting seeds. I have been wanting to do this for awhile but like you don’t want to buy a lot of expensive equipment. I am taking notes as I read:-) I love the pictures, I seem to do better if everything is spelled right out for me. Just one quick question on the cheap shop light….what kind of bulbs do you use….watts?? or maybe there is just one kind, my husband has lots of shop lights in his wood shop but he is napping or I would ask him! Your blog is my absolute favorite!! Funny how there is always someone out there you can really relate to. I love every single post! I don’t usually subscribe to anything but did to yours though I usually can’t wait and check your blog first thing in the morning while I eat breakfast so have usually read the post before I get the email. Thanks so much for all you do! And my daughter says “Strawberries!” And oh yeah……raspberries…….IEEEEEE! But I think I’m gonna try again, this time with a couple of raised garden beds, and start experimenting with crops slowly. 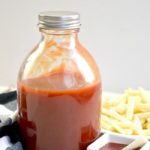 I want to make my own tomato sauce, spaghetti, and salsa, so I’m planning on growing tomatoes and onions and a pepper plant or two in one small bed and then some salad fixins in another. If I like it, I will add on (Okay, I have to try the potatoes in the straw like my neighbor did, that just looks too freaking cool) and try more things next year!